So does the air control layer go on the outside or the inside? How about both sides? How about one in the middle? Do I want one water control layer? How about two or three? Yes, yes, I know…if you do it right all you need is one air control layer (aka “air barrier”) and one water control layer (aka “water resistive barrier or weather resistive barrier or wrb”). But what are the odds of doing it right all the time? You’ve got to ask yourself one question: Do I feel lucky? Well, do you, punk? There is nothing wrong with multiple systems redundancy. The aircraft industry does it all the time for safety-critical systems. One of the definitions of a safety-critical system is “a system whose failure or malfunction may result in loss or severe damage to equipment or property. It should be pretty obvious by now that the failure of either a water control layer or air control layer can lead to loss or severe damage to equipment or property. So how does this work in the real world of buildings? Let’s start with the easy stuff first….air control. Look at Figure 1- a pretty standard wood frame wall assembly. It has a drained and vented cladding over continuous exterior insulation. The continuous exterior insulation is installed over “something”. The “something” is installed over the sheathing or the “something” is the sheathing itself… The sheathing is installed over wood framing…and the wood framing lined on the interior with gypsum board. The wood framing is insulated with “something”. Figure 1: Standard Wood Frame Wall Assembly- A drained and vented cladding over continuous exterior insulation. The continuous exterior insulation is installed over a water control layer. The water control layer is installed over the sheathing or the water control layer can be the sheathing itself… The sheathing is installed over wood framing…and the wood framing lined on the interior with gypsum board. The wood framing cavity is insulated. Let’s assume that the “something” is a mechanically attached sheet membrane water control layer. Can a mechanically attached sheet membrane also act as an air control layer? Yes, of course (see BSI-084: “Forty Years of Air Barriers”, February 2015). The sheet membrane can be a mechanically attached layer with taped joints integrated with the “punched openings” (aka “windows and doors”) and service penetrations. Let’s further assume that the “something” the wood framing is insulated with is fiberglass or cellulose. Neither fiberglass nor cellulose are air control layers. It is important to keep the air out of the fiberglass or the cellulose from both the outside and the inside for both thermal control reasons and vapor control reasons. Can the interior gypsum board also act as an air control layer? Yes, of course. See previous reference. So why not have both the sheet membrane water control layer and interior gypsum board act as air control layers. Two air control layers…one on the outside and one on the inside. Awesome (Figure 2). Figure 2: Two Air Control Layers- Sheet membrane water control layer and interior gypsum board act as air control layers…one on the outside and one on the inside. Awesome. Can we combine the water control layer and air control layer functions of the mechanically attached sheet membrane with the exterior sheathing itself? Yes, of course. We can install a fully adhered membrane to the exterior sheathing that will act as both the water control layer and air control layer. We can apply a fluid applied water and air control layer to the exterior sheathing that will act as both the water control layer and air control layer. Finally, we can have an integral water and air control layer as part of the sheathing itself…the sheathing can come with its own water and air control layer as part of its composition. Also awesome (Figure 3). Figure 3: Two Air Control Layers Continued– We can install a fully adhered membrane to the exterior sheathing that will act as both the water control layer and air control layer. We can apply a fluid applied water and air control layer to the exterior sheathing that will act as both the water control layer and air control layer. Finally, we can have an integral water and air control layer as part of the sheathing itself. Also awesome. Now let’s change the wood framing cavity insulation from fiberglass or cellulose to spray polyurethane foam (SPF) insulation. Unlike fiberglass or cellulose, SPF is an air barrier material. It does not matter whether the SPF is “low density” or “high density”. The SPF can replace the air control layer function of the interior gypsum board. Once again, awesome (Figure 4). Figure 4: More Two Air Control Layers Continued– In this example the wood framing cavity insulation is spray polyurethane foam (SPF) insulation. Unlike fiberglass or cellulose SPF is an air barrier material. It does not matter whether the SPF is “low density” or “high density”. The SPF can replace the air control layer function of the interior gypsum board. Once again, awesome. Let’s go to Minnesota and Canada….they are pretty much the same anyway. Can we use sheet polyethylene as an interior air control layer? Yes, of course (Figure 5). The issue has always been what happens if my exterior sheathing is also a vapor barrier? Now I end up with a “double vapor barrier”…one on the outside and one on the inside. Relax, double vapor barriers work…but with some caveats. In general, avoid them if you can. If you can’t, stay away from interior vapor barriers in hot climates and mixed climates and pretty much any place with lots of air conditioning. 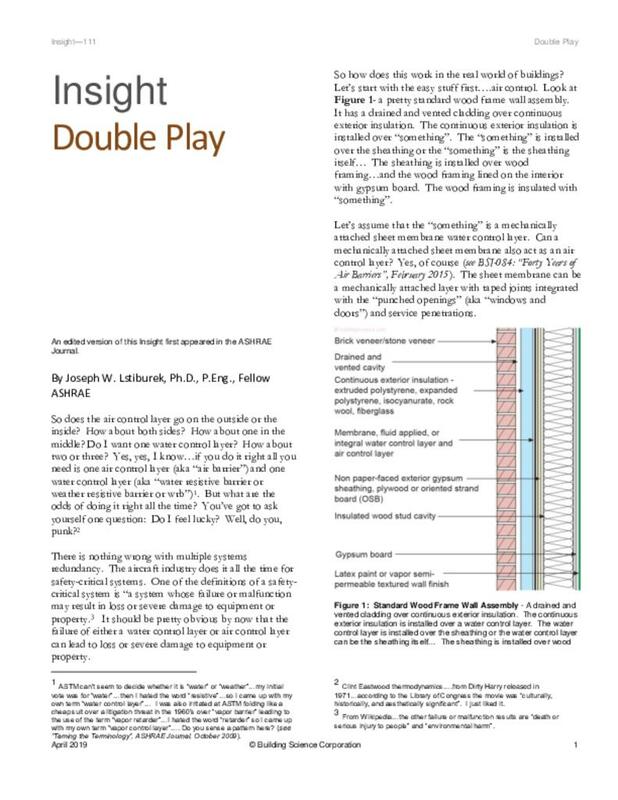 See BSI-092: Doubling Down - “How Come Double Vapor Barriers Work”, February, 2016. Figure 5: Sheet Polyethylene Interior Air Control Layer- The issue with interior polyethylene air barriers has always been what happens if my exterior sheathing is also a vapor barrier? Now I end up with a “double vapor barrier”…one on the outside and one on the inside. Relax, double vapor barriers work…but with some caveats. In general, avoid them if you can. If you can’t stay away from interior vapor barriers in hot climates and mixed climates and pretty much any place with lots of air conditioning. So much for the easy stuff. Let’s work on stuff that can be a bit more complicated…water control layers. In the grand scheme of things water control layers are more important than air control layers. Do not forget that…ever. So we have three water control layers in Figure 1…the cladding (which leaks a little)…the continuous exterior insulation (which leaks a little) and the “water control layer” (which, yes, leaks a little). The idea is to limit the “little” as much as possible and the key approach is to control hydrostatic pressure….and you do that by allowing drainage. Drain the rain….if you do small holes will not matter. For drainage to occur you need a drainage gap…a drainage space. How much of a gap? Ah, it depends. Read on. Turns out the gap is not just for drainage but for drying…but we don’t call it drying we call it “hygric redistribution”. Why not just call it drying and leave it at that? One way to limit damage is to reduce the concentration of water at a point of entry. Have the water move away from the initial point of wetting…have the water spread over a larger surface area thereby reducing its concentration at each point. Sort of drying…but not drying…not at first anyway. Pull the water away and spread it out and then give it time to dry…. (we were here before, see BSI-038: “Mind the Gap, Eh?”, November 2013). OK, now for some history…obvious history that needs to be restated. Way back in the day….we only had the cladding acting as the water control layer. That was all we needed when we built out of rocks and thousand year-old trees and did not insulate. Things have changed. First, the materials that buildings are constructed from have changed dramatically. The newer materials are by and large more sensitive to water damage than the older traditional materials. We used to go to forests and cut big trees down, cut them into boards, build boats out of them and sail them around the world. Try doing that with oriented strand board (OSB). We have paper faced gypsum in place of plaster and lath. We have engineered wood “I-joists” in place of dimensional framing. Second, thermal insulation was added to wall assemblies, roof assemblies and foundation assemblies. The function was to keep the heat inside during the heating season and keep the heat outside during the cooling season. We added more and more and more. We have reached the point where very little energy exchange happens across building assemblies. This is both good and bad. The good is that buildings are very comfortable and consume very little energy. The bad is that the ability of building assemblies to dry should they start out wet or get wet during service has been reduced. Drying is an energy exchange process. Less movement of energy less drying. Back in the day when we had poorly insulated buildings the energy exchange was great and we were not very concerned about “incidental water”. For example, windows have always leaked. Not a lot, but a little. When they leaked into wall assemblies that were uninsulated or poorly insulated they were able to dry due to the exchange of energy across the wall assembly. We called this water leakage “incidental water” and didn’t worry much about it as it did not lead to damage. Today, we can’t ignore incidental water as energy is not available to promote drying. This “no longer incidental water” has led to a fundamental change in how we install windows and doors, how we flash service penetrations and how we install claddings. Because of these changes we need multiple lines of defense for both rain control and air control. We need multiple systems redundancy. It is pretty clear that no water control layer will ever be perfect…so we have to assume some holes will exist. Having said that…just because you have a hole does not mean much water will go through it if there is no force to push the water through the hole. The force is called hydrostatic pressure…and we control by providing a gap that provides drainage. In fact, we might want multiple gaps…for multiple systems redundancy. We were here before (once again see BSI-038: “Mind the Gap, Eh?”, November 2013). In Figure 1 we should have two “drainage gaps”. The first is obvious…immediately behind the cladding. No surprise there. The second? Ah, between the continuous exterior insulation and the “water control layer”. How much of a gap for the second gap? What works is somewhere between 1/32of an inch and 3/16 of an inch. Note that the larger the gap the more loss of thermal efficiency of the continuous exterior insulation. At 3/16 of an inch you lose about 5 percent of the value of the continuous exterior insulation. At 3/16 of an inch you get a boatload of drainage…you also get lateral hygric redistribution. So how do you get the gap behind the continuous exterior insulation? There are “draining housewraps” and “draining wrb’s”…basically “textured” sheet goods that create a space or a gap (Photograph 1). There are draining continuous exterior insulations such as rockwool and “groovy” rigid foam insulations that have cross-cut grooves (Photograph 2) or grid drainage channels (Photograph 3). Photograph 1: Gap Behind Continuous Exterior Insulation- There are “draining housewraps” and “draining wrb’s”…basically “textured” sheet goods that create a space or a gap. Photograph 2: Draining Continuous Exterior Insulation - “Groovy” rigid foam insulation that has cross-cut grooves providing drainage. Photograph 3: Draining Continuous Exterior Insulation- Grid drainage channels in rigid foam insulation. What happens when we have stucco and stone or wood shingles or fiber cement or wood based siding? Ah, easy. Stucco needs a gap of at least 3/16 inch. We can get that with a drainage mat (Figure 6). Stone cladding needs a drainage gap of at least 1/2 inch. We can get that with a drainage mat. Why a bigger gap with stone than stucco? Ah, stone claddings leak more than stucco (Figure 7). Wood shingles need a gap of at least 3/16 inch. We can get that with a drainage mat (Photograph 4). And finally with fiber cement or wood based siding we need a gap of at least 3/16 inch and we can get that with furring (Photograph 5). So where are we in all of this...at least two air control layers…two or three water control layers…and one or two drainage gaps. Easy as one, two and three. Figure 6: Stucco Cladding- Stucco needs a drainage gap of at least 3/16 inch. We can get that with a drainage mat. Photograph 4: Drainage Matt for Wood Shingle Cladding– Wood shingles need a drainage gap of at least 3/16 inch. Most drainage matts are ¼ inch to 3/8 inch so they work well. Photograph 5: Furring for Fiber cement or Wood Based Siding– Fiber cement or wood based siding need a drainage gap of at least 3/16 of an inch. ASTM can’t seem to decide whether it is “water” or “weather”…my initial vote was for “water”…then I hated the word “resistive”…so I came up with my own term “water control layer”… I was also irritated at ASTM folding like a cheap suit over a litigation threat in the 1960’s over “vapor barrier” leading to the use of the term “vapor retarder”…I hated the word “retarder” so I came up with my own term “vapor control layer”…. Do you sense a pattern here? (see “Taming the Terminology”, ASHRAE Journal, October 2009). Clint Eastwood thermodynamics….from Dirty Harry released in 1971…according to the Library of Congress the movie was “culturally, historically, and aesthetically significant”. I just liked it. From Wikipedia…the other failure or malfunction results are “death or serious injury to people” and “environmental harm”.